One of the most important traditions of Tibetan Buddhism, Losar predates Buddhism and reflects ancient connections between astronomy, astrology, and the passage of time. Each year is associated with one of twelve animals and one of five elements, which recur in 60 year cycles. So year 2012 in the Christian calendar is year 2139 in the Tibetan calendar, and the animal it is associated with is the dragon and the element water - hence it is the year of the Water Dragon. It should be an occasion for celebration. 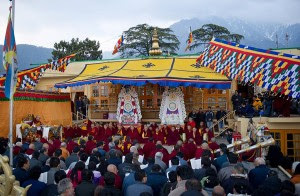 But in Tibet this years Losar celebrations took place against a background of lethal force and increased repression, and for the exiled Tibetan community in India, there is little to celebrate. The start of Losar this year as been marked by sorrow, and observed in a much more solemn manner, as celebrations were cancelled in mourning for the Tibetan monks and nuns who have set themselves on fire (self-immolated) in recent months. They were protesting against the continued illegal Chinese occupation of Tibet and the appalling breaches of Tibetan human rights at the hands of their Chinese-occupiers, and calling for the return of the Dalai Lama, from exile. Thus the exiled Dalai Lama led Tsedhor, the official prayer ceremony, from the rooftop of the Tsuglha Khang temple at McLeod Ganj, Dharamsala in the northern Indian state of Himachal Pradesh, he reflected quietly and paid tribute to all the Tibetans who have sacrificed their freedom and their lives in protest against Chinese policies in Tibet. After the religious ceremony, the Tibetan Parliament-in-Exile began a day-long solidarity hunger strike for the victims of Chinese police and self immolation protests. Yet the official Chinese state-controlled media reported that, "Tibetans from the "Tibet Autonomous Region" (TAR) and several Tibetan prefectures in China celebrated their New Year with traditional ceremonies in the temples and monasteries". The Lhasa Authority have tightened security yet further and restricted the movement of Tibetan pilgrims, having previously issued orders requiring Tibetan officials and the general public to prepare song and dance routines for Losar. Performers who refused to take part in the mandatory show of celebrations were warned of severe punishment. 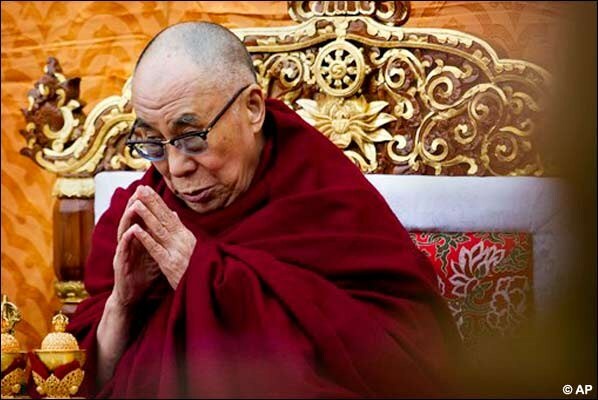 The Chinese government have also temporarily released some of the Tibetans who were arbitrarily detained upon their return from pilgrimage to India and Nepal, together with several detained Tibetans undergoing "patriotic re-education". Last month, Tibetan sources confirmed that Chinese government officials were issuing bribes of 500 Yuan for each Tibetan family to participate Tibetans in Losar celebrations. 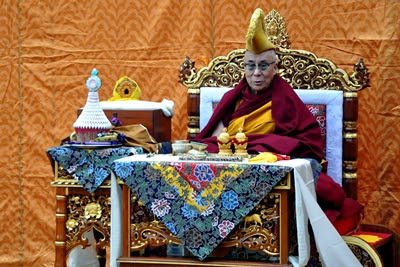 Thus even Losar is subject to Chinese orchestration, with Chinese officials dictating the agenda, infiltrating the religious establishments to control and limit the numbers of genuine Tibetan monks and nuns involved, and forcing a show of jollity and merriment from an unwilling Tibetan people. Like so many Tibetan Buddhist religious festivals, the Chinese government has appropriated Losar as a propaganda opportunity to conceal the truth from the outside world about the real relationship between Tibetans and their Chinese oppressors. Sadly, since the riots of two years ago, the Chinese Government have banned independent observers and the world's media from entering Tibet to witness the situation for themselves. So this is how 2139, Tibetan Year of the Water Dragon 2139, began. But why am I telling you all this? 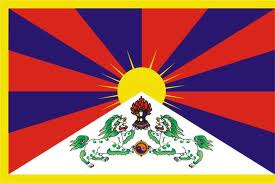 Because Tibet is a country and nation very close to my heart. One of the first books I remember reading as a very small child was Herge's "Tin Tin in Tibet", and this distant Himalayan kingdom has fascinated me ever since. I began to devour everything I could read about Tibetan history, religion and culture, and especially Tibetan Buddhism. 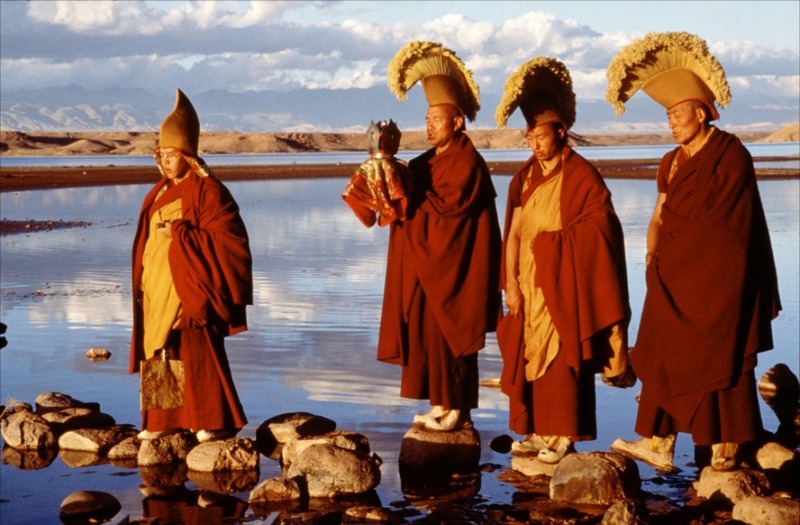 My library of books, articles, documentaries, films and photographs about all aspects of Tibet and Tibetan life have become extensive over the years. My yearning to know more grew even stronger after my first visit: Tibet was one of the most isolated and harsh yet beautiful places I've ever been on earth, and the Tibetan people touched my heart and moved me beyond words with their intensely deep spirituality, and a calm serenity despite the cultural genocide they have been subjected to for decades at the hands of their Chinese oppressors. On my return from my first visit I decided I had to help Tibetans in whatever way I could, and became a supporting member of Free Tibet, The Tibet Society and the Tibet Relief Fund. I've also raised money for the International Campaign for Tibet, and have been supporting Tibetan children living in exile in India through education for several years. I currently support 9 children of all ages, and eagerly look forward to their beautiful heartwarming letters containing news, drawings and school reports. 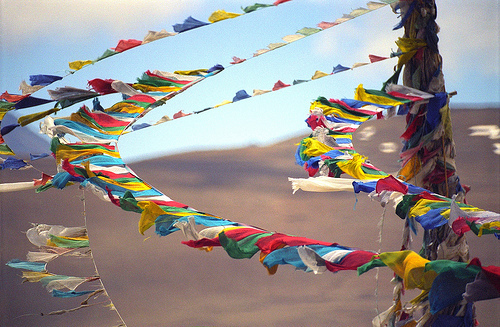 Tibetan Prayer Flags are known as Lung Ta, literally "Wind Horses". and many thousands of Tibetan lives were lost. Since then, Tibetans have become second class citizens, discriminated against and marginalized in their own country, their identity, unique culture and language threatened with extinction. Tibetans have no basic human rights, are not allowed to travel outside of China, and are squeezed out of the economy, the education system and even their own religious institutions. Children are now only taught Chinese in school in an attempt to eliminate Tibetan culture. 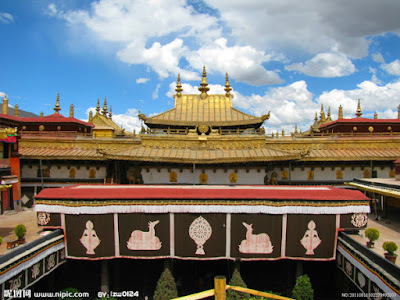 Aspiring young monks have to apply to the Chinese government, who invariably ignore their requests in order to limit the influence of Tibetan Buddhism. The Chinese government is systematically exploiting and eroding the immense natural resources of the Tibetan plateau, filling its own coffers at the expense of the Tibetan people. The Chinese insist that they have "liberated" the Tibetans and brought financial investments and modernisation to the Tibetan people, but there are few visible benefits to the Tibetans themselves. The new high speed rail link between China and Tibet has only served to increase the seemingly endless stream of Han Chinese settlers and, of course, the all pervasive Chinese military: huge numbers of arrogant young Chinese soldiers, heavily-armed, patrol the streets in a menacing manner. 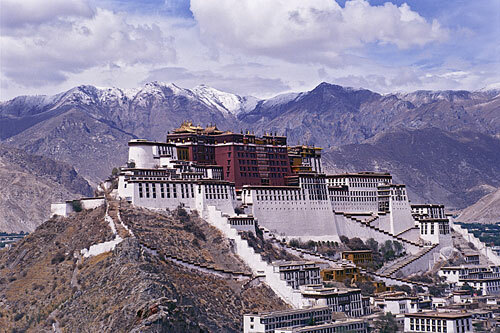 Tibetan language radio broadcasts, from foreign radio stations such as Voice of Tibet, are jammed. Most of the street and shop traders are Chinese, not Tibetan. Tibetan homes have been demolished and replaced with characterless concrete buildings, and Lhasa has been transformed into a Chinese city, with - at last count - less than three per cent of the "Tibetan quarter" of Lhasa remaining intact. The concrete tower block looming over the Jokhang Temple, a sacred Buddhist pilgrimage site built in 647, houses the headquarters of the Chinese Public Security Bureau, a provocative symbol of the Chinese government's constant surveillance of Tibetan lives. 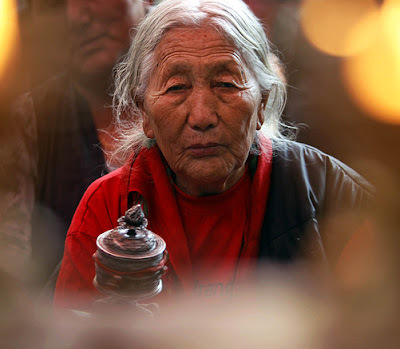 It makes me want to cry, and my heart bleeds for the Tibetan people.